What is it about the fragrance of Lavender? To me it just smells like Summer rain..
My long awaited dried lavender bunches arrived from Antique Farmhouse and I couldn't be happier. 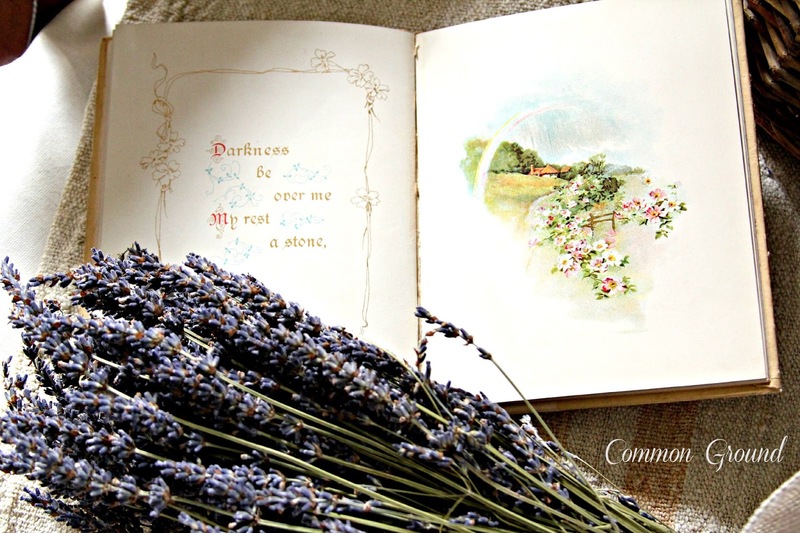 It's so hard to find lavender here in the Midwest, and online prices generally run high for just a small bunch. I tried growing my own last year, but bees took over our back yard and built hives in the birdhouses and pool equipment... that was the end of my lavender growing. 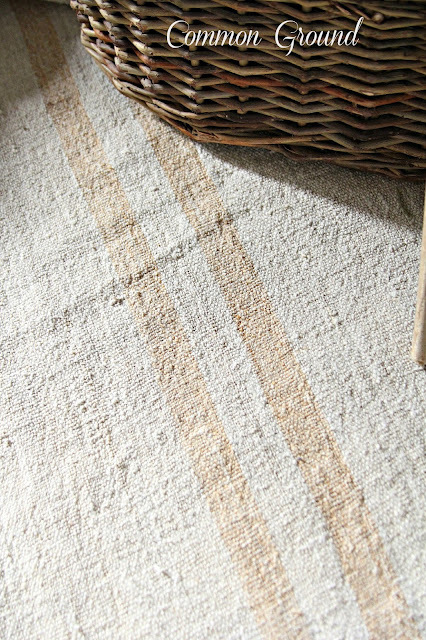 If you don't know Antique Farmhouse then you should. They have beautiful items with new "events" daily. Things sell out fast so you have to be quick. I don't think it's available at this moment but keep checking back they may have more in. Anyway, I bought two orders of 3 bundles each, and I could smell that magical fragrance before the box was opened. 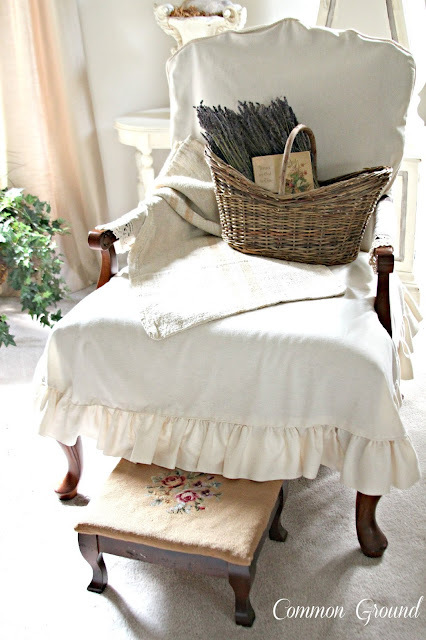 ...so I had to do a little styling in an old Frenchy basket. Anyone know technically what this basket was used for? Harvesting flowers maybe? I've also used it for wine bottles, and French Baguettes. 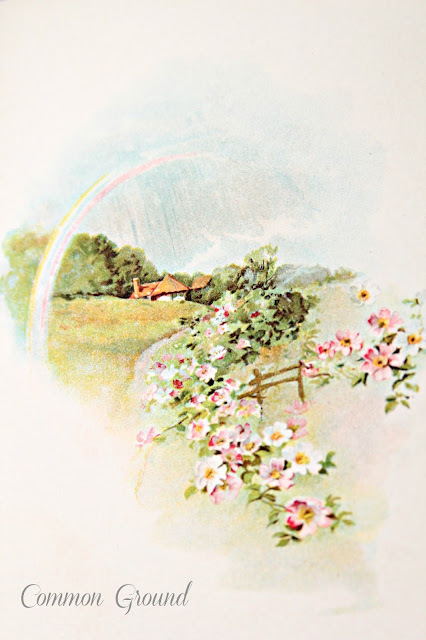 and this one has precious illustrations. We're in the Living Room on one of my Bergere Chairs that I slipped a few years ago. And I wanted to show you my new grainsack that I talked about here. It's heavier than my others and has two yummy caramel stripes down the center. so I just covered them with some burlap ribbon. I just used three of the bundles in the basket, so the rest came into the Dining Room and found a spot on the breakfront in a wine crate. Love those beautiful shots, Debra- wow! I grow lavender easily here in mid Ohio - secret is to NOT water too much, they like very well drained not soggy legs. Ignore it and it shall grow! We had an underground beehive under a huge lavender bush that we had to move this summer b/c the meter-reader guy couldn't get to it. Not sure the replanted bush is gonna make it. Had it ten years, dang it. Anyway, loving your post. Not ready for fall, it's finally beautiful here!!! I'm with you Debra, lavender is intoxicating, love to keep a sachet near my bed, it's very relaxing at bedtime. Enjoy! i just love fresh lavender! 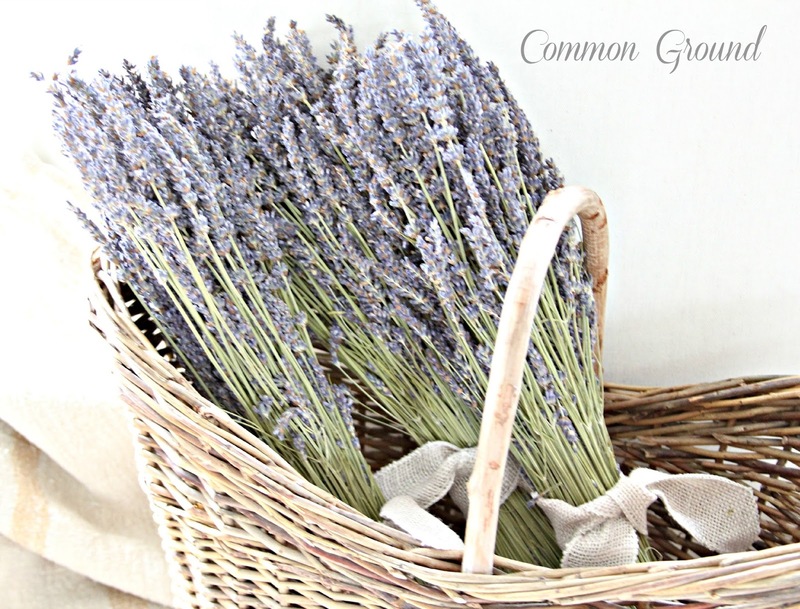 i have 15 bundles coming straight from the lavender farm tomorrow! the shop is going to smell amazing!! Your assistant is doing a fine job. Beautiful photos Debra. Debra, your photos are beautiful! I can almost smell the lavender from here! It's just such a fresh scent! You have styled yours beautifully. I'm ready for fall too. And I'm SO glad to be back at Blogger. I'm sure my blood pressure has lowered. I think I may have the Feedburner thing figured out. Godaddy was useless. I adore lavender. I spray it on linens because it induces sleep. I have a basket like that; don't know what it's for. Oh I love the lavender. I could almost smell it through the computer!!!! It looks so pretty in your basket and wine crate. I bet it makes the house smell great. I bet your kitty loved rolling in it!!! 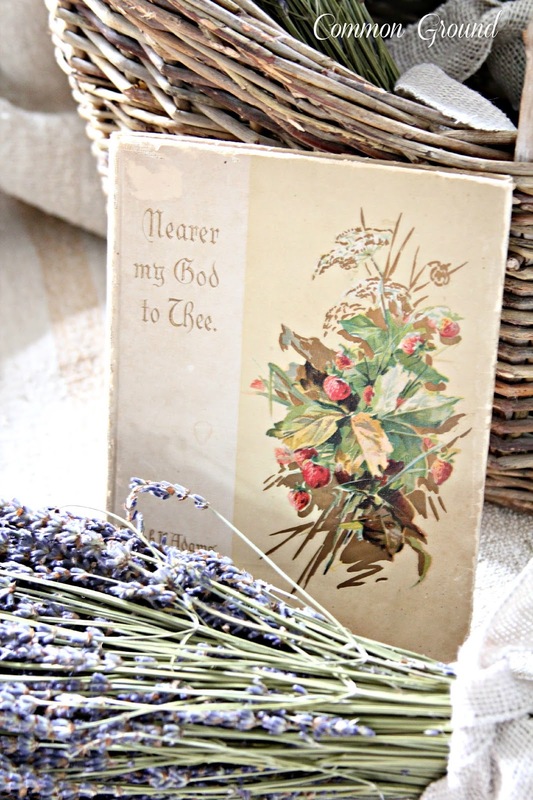 Hi Debra, I love to put lavender sachet in drawers to give it such a wonderful smell. I have never tried to grow it. We could use a little more rain in our neck of the woods and thankful for the rain we have gotten. Your assistant is doing such a good job of helping ( just kidding). I enjoyed your previous post. Enjoy your day. Hugs and Prayers from Your Missouri Friend. Debra, the lavender bundles are lovely! Makes me wish I had ordered some. 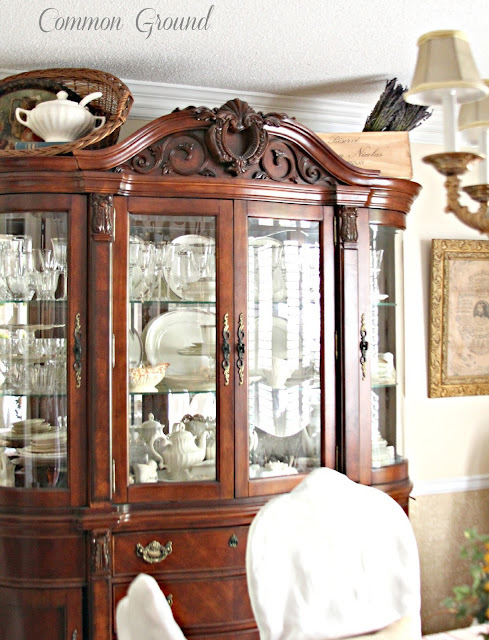 I shop Antique Farmhouse and Decor Steals. I've never been disappointed. Love having lavender in the house! I can almost smell your lavender from here, Debra! They look perfect in your pretty Frenchy basket. 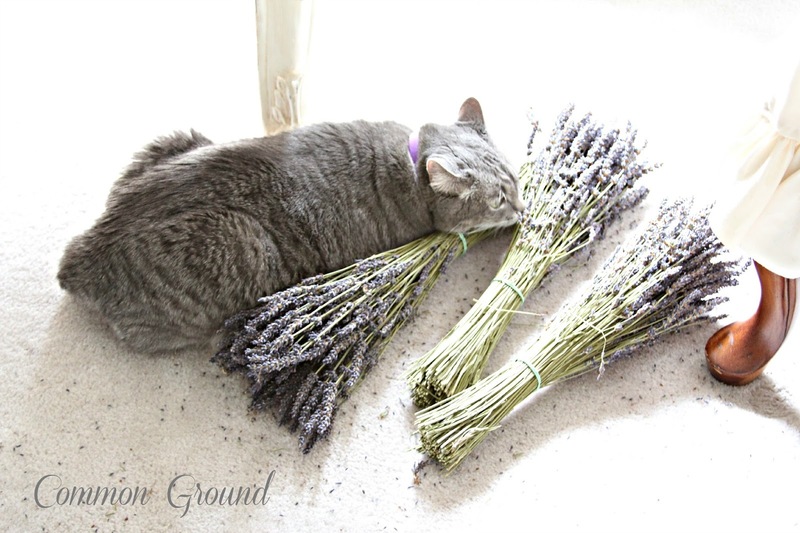 Looks like miss kitty is feeling pretty relaxed with all of that wonderful lavender aroma! Your Styling Assistant knows the real thing when she sniffs it!!! We only had one blooming of lavendar here in The Herb Garden! Waiting for the second coming to harvest. . .was not a good choice!!! Hopefully, next year will bring a "bumper" crop!!! The lavendar styling in your chair is exquisite!!! Ah~h~h. . .such a 'heavenly scent'!!! Just beautiful Debra! 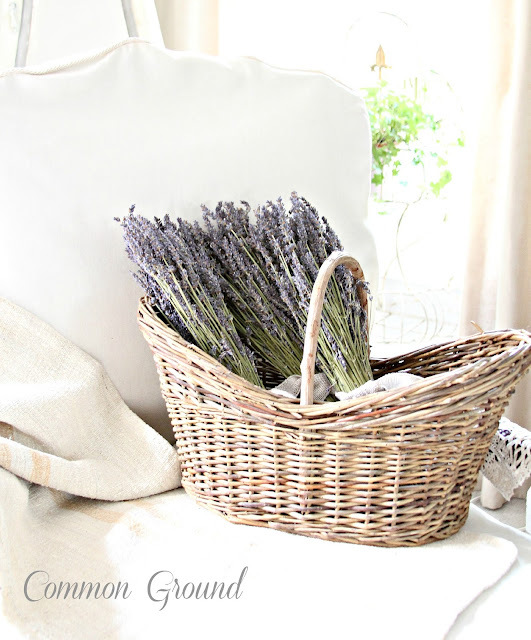 Love the lavender, the basket, your assistant... my cats love rolling in lavender too. It's a wonder I ever get to harvest any! Enjoy your sweet scents! Love lavender. Your pictures are pretty! They are taste good to eat too! My lavender bushes were amazing this year, harvested a ton of buds and bundles!!! The past two summer were so hot they got fried.....but this year has been beautiful, and they re-seed everywhere, even under the pine trees!!! My fur babies also loved rolling in it, I could never keep it in the house in a bowl or basket, they were sooooooo naughty!!! But I make a lot of sachets for gift giving and to sell. Your displays are always so lovely!!! Hi Sweetie! I share your love for lavender! My favorite is a combination of French and English! Yours is lovely, and I love that little book! Precious! I have a grain sack like your new one. It is on top of the bench at the foot of our bed. One of these days I will get to actually reupholstering the bench with it!!! Hope your summer has been good! You're not in the path of any flooding are you? I love lavender also. Just cut back my bushes as they were getting so big. 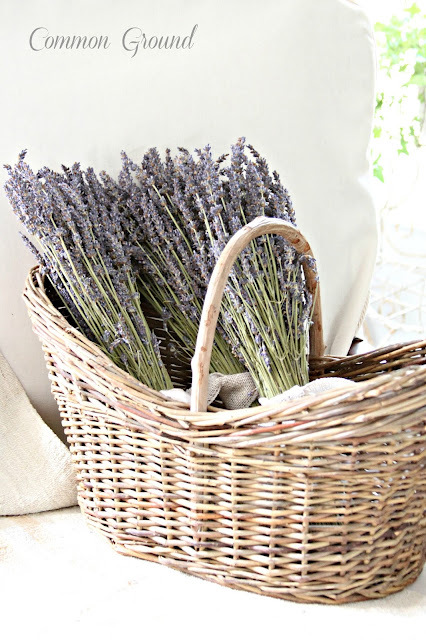 i like how you place the lavender bunches in your frenchy basket. I also like what you did to the top of your hutch. Mine is bare and you have given me a great idea. Stop by and see my gardens and hummers. How lovely! I absolutely love lavender... the color, the smell.. Yours is just beautiful! I bet your home smells heavenly!! I will have to check out the site that you bought them at. It's always good to hear of new sources for things. And oh, my goodness... the bees and how they took over your backyard! Yikes! Yes, I agree that finding an online source is a better way to go!!! Your assistent is such a cutie and she did a great job. The lavender in the basket looks so pretty and must smell heavenly. I love the shape of the basket but have no idea for what special purpose it might have been made for. The grainsack is beautiful. I don't think I've seen one with a caramel colored stripe before. I love the smell of lavender, too. Pretty shots and your assistant likes it too. Maria at Dreamy Whites has good prices on hers, too if you ever need more and free shipping. Your picture looks very "Provence" to me, indeed! At least when you tried growing it you got bees. My attempt just looked at me, said "no thank you" and keeled straight over! Love the smell as well. In fact, I still buy Yardley's lavender soap just for the scent in drawers...the dresser ones...not mine! Nice styling with your lavender, Debra. When I saw those advertised, by first thought was, "wow! I could cash in on my bumper crop this year!" I was also wondering if the bunches would arrive with buds loosely falling as they do when dry, or whether they were sprayed with something to preserve them - can you tell? When my sister makes the sachets from our lavender, it takes a lot of buds to fill one nicely, but oh the fragrance! And it lasts and lasts...years! I keep them in all my linen and sweater drawers to ward off potential pests. I just love lavender! Funny how your cat wanted to roll in it...wonder if it's similar to catnip for them? Debra your photos are gorgeous!! I love lavender too! The lavendar looks luscious in that basket Debra! Your home looks so pretty! 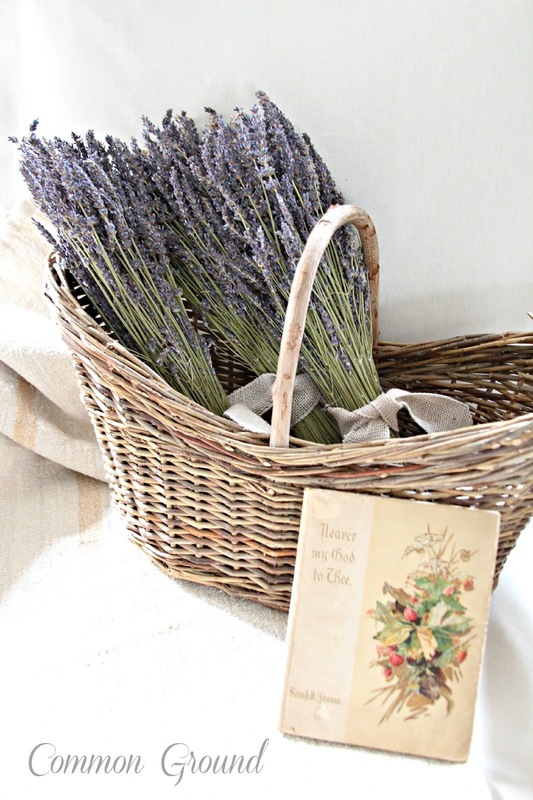 I love your French lavender and the basket in which you display it. Now, I need to keep watching American Farmhouse to see if they offer the lavender again. Once again, blogging is getting my pocketbook (my grandmother's term for purse) in trouble. Beautiful! Our new kitten rolled all in our lavender too. It must be something cats are attracted to! love the slipcovered chair picture, debra:) i can't grow lavender, but, it doesn't stop me from trying-ha! and if my lavender is dead, my neighbor's cat goes straight for the catmint:) love american farmhouse! I love lavender - the smell - the look of it - everything- but I'm drooling over your buffet/hutch Debra - WOW is that a beauty!!! Your beautiful pictures make me want some in my home too! Your lavender bunch looks so lovely in your basket. Kitty looks so sweet alongside too. I can just imagine how lovely your house smells! 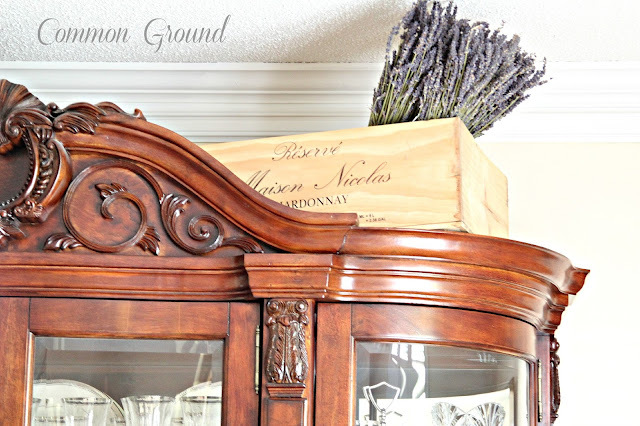 Great job on styling the lavender and thanks for linking up at the Inspiration Gallery! Oh, no, not fall yet. The weather at the beach is just getting hot. But, September and October are favorite months when the weather is warm and so is the ocean. Love your lavender. My cat loves to roll in it also. HI Debra! 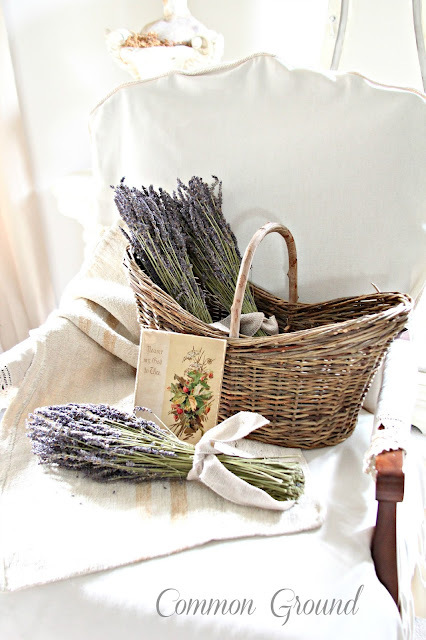 I'm popping over from the Pinterest Party and I've just pinned the lovely vignette of lavender in your pretty chair. just looking at your photos brings a sense of calm and peace. I'll keep checking as you suggested .. Such pretty photos-pure eye candy. Lavender is divine. I love those beautiful photos! Fresh lavender is divine. My kitties would certainly try to eat it. Thanx for sharing at THT! I bet it does smell wonderful. Beautiful vignettes Debra and your little helper is adorable. Thanks so much for sharing at Amaze Me Monday! What a wonderful presentation! And it looks like one very happy kitty.